Adrienne Speck is the biggest loser in her high school, so she can hardly believe it when a magical boy falls from the heavens to grant her three wishes. He is cool, confident, and definitely popular crowd material—everything Adrienne's not. With his help, she has a chance to get everything she's ever wanted: get kissed, get popular, and get a date for the upcoming dance. But Adrienne discovers magic isn't all it's cracked up to be, and the road to popularity is paved with humiliation. To make her dreams come true, not only will she have to get the lead in the school play, ask out the most popular guy in school, and stand up to the current queen of popularity, but also keep her personal genie from trashing her room, dressing like a nerd, and revealing to her mom that he's living in their attic. For someone who's supposed to be helping her, he couldn't be making her life any worse. That is, until she starts to fall for him. I first have to say that Starlight definitely had potential, but it just fell short for me. In the beginning, it was pretty good. To be honest, the basis for the story is a Cinderella/Teen/Disney Movie that we've all seen or heard before. I really wanted to like it, but in the end it just wasn't for me. The first thing that lost me were the characters. They are only 16, but they just seemed a lot more immature than other 16-year-olds I've read about before. I'm sure I probably acted this immature when I was 16, but I like maturity in the books I read and Starlight's characters just didn't have it. It was also a tad too short. Everything happens in such a short amount of time that it made it a little unbelievable and didn't give us enough time to attach to the story and characters. Maybe if I would have gotten to know Adrienne more, I would have liked her more. The number one thing that I didn't like about the story was the predictability. I mean, we all know that we have a dorky girl in need of help, a white knight who comes along to save the day, and they fall in love. That's fine. That kind of predictability I'm cool with. What I'm not cool with is when the entire plot is pretty much told to you in the beginning. 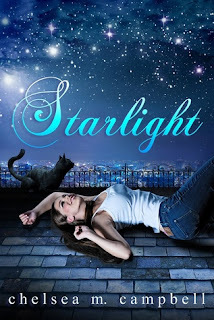 In Adrienne class, they are reading a book called Starlight. In the book it is a human boy who needs help, and a female star comes to help him. What the boy doesn't know is that if he tells the star he loves her, she can stay with him. He doesn't tell her in time, and she bursts into star dust, never to be seen again. Adrienne's story and the story they read in class is almost identical. This killed me. If Adrienne never read the book in class, I would have enjoyed it more. If Adrienne would have put two-and-two together and saw the similarities herself, I would have enjoyed it more. If literally, there were any differences between the school book and Adrienne's actual life, I would have enjoyed it more. I just didn't like being told what is going to happen, Adrienne being completely blind to it, and then it happen almost exactly the way I was told it would. I mean the ending's are slightly different, but I don't think that really counts. You must be wondering, "then why the heck did you keep reading it?!" That answer is simple. Chelsea Campbell's writing. I know it doesn't make sense, but although her characters were immature, her writing was not. She's not an amateur writer. It's cohesive, makes sense, and somehow kept me believing her story long enough to get me to the end. I may not have liked this story very much, but I enjoyed her writing tremendously. I'm glad I read the book, because there were times that I did enjoy it. The problem was that it was too predictable, the characters were too immature, and the length of the book was too short. However, I did really enjoy Chelsea M. Campbell's writing. Her writing style is very done and made me keep reading. I may not have enjoyed this particular story, but it definitely won't stop me from trying her other work. In the end, don't just take my word for it. Read it for yourself and form your own opinion. I may not have liked it, but you may love it!